Hello everyone, welcome! I am an excited person today, more so than the other night when I had a shandy and talked gibberish for hours. (I don’t normally drink so I qualify as a light weight). Anyway, the reason I am excited is that wave one of my most hotly anticipated Kickstarter arrived this week and I got to guddle about in the box. And it was awesome. If you didn’t figure it out from the title, the Kickstarter in question was Lords of Hellas by Awaken Realms. Lords of Hellas is a game set 1000 years BC in Ancient Greece, with a bit of a twist. All the Greek Gods and Monsters are real, however they are aliens and their powers are simply advanced technology which they are more than happy to share with their worshipers. 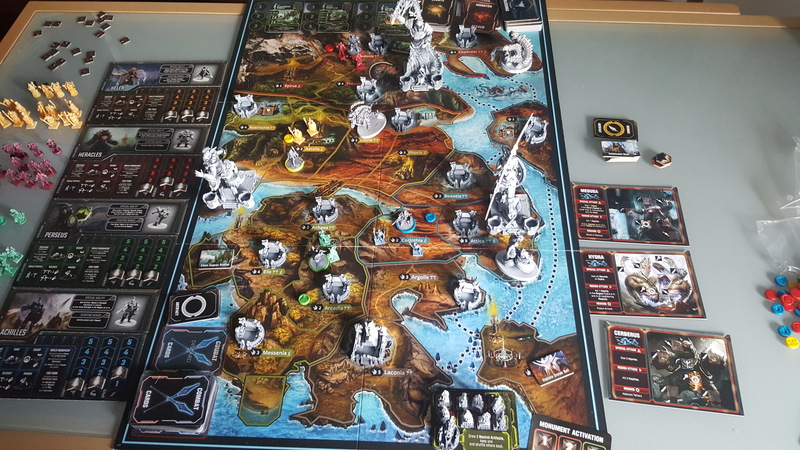 Lords of Hellas has a variety of ways to win, including Territory control, Constructing a monument to the gods or slaying monsters. Multiple options means multiple ways to play, with replayability added to by the fact that there are three monuments to choose from (Athena, Zeus, Hermes) and that is only the core set. In Wave 2 we can expect Apollo, Hades, Hephaestus, Atlas and Poseidon. Anyway, enough babbling by me. Lets look in the box. Since originally publishing this post on Feb 12 2018 I have since done a How to Play Video. I include it now. As is customary in these posts, I will now include a legion of photographs. You will note there is room in Sparta and the City miniatures for a Hoplite Unit to “Fortify”. The terrain expansion was a Kickstarter thing, the core board still has symbols and room for a Hoplite to fortify. There are multiple Temple cards, one of which is assigned at random at the start of the game. Each one has a different order of when Blessing Drafts happen, and they also have differing rewards for building the Oracle of Delphi (The big one at the front). The miniatures are from the Terrain expansion, the base game ships with card representations. And now that we have seen the Gods in all their five parted glory, we look at the monsters. Monsters are played when their respective event is drawn from the Event Deck. Of course, slaying monsters is not the only way to be heroic (and thus earn glory). You can complete Quests by visiting their location. Once arrived, if the Hero meets the pre-requisites for level one of the quest, they move from the main board to the Quest Board. For instance, if pre-requisite one was “Be in focus when getting pictures taken”, Achilles would not be able to initiate the quest. Once on a quest track, heroes cannot leave until completion. If they meet the requirements, each turn they can advance one space on the track until completion. Now, let’s have a closer look at some of the cards. For a game with a lot of options, it is helpful to have prompt cards. Lords of Hellas provides two of these. And that is all for me today. I will be updating this post in the future with a “How to play video” however, I cannot give a definitive answer on when that will be. Anyway, that is Lords of Hellas. It looks really awesome and I hope to have more to tell you about it soon! Bye for now. Annoying little voice again: “It’s monday that means we usually get a new post from John about boardgames…oh look there it is ” Me trying to ignore the voice and moving on. Annoying little voice again “Ah…this looks like a game that can’t be played solo…so you are safe, no harm in checking this out”. The art and graphics look amazing!